Honestly, I hadn't been struck at how vulnerable I am being thousands of miles from "home" dependent on this motorcycle to get me from place to place. 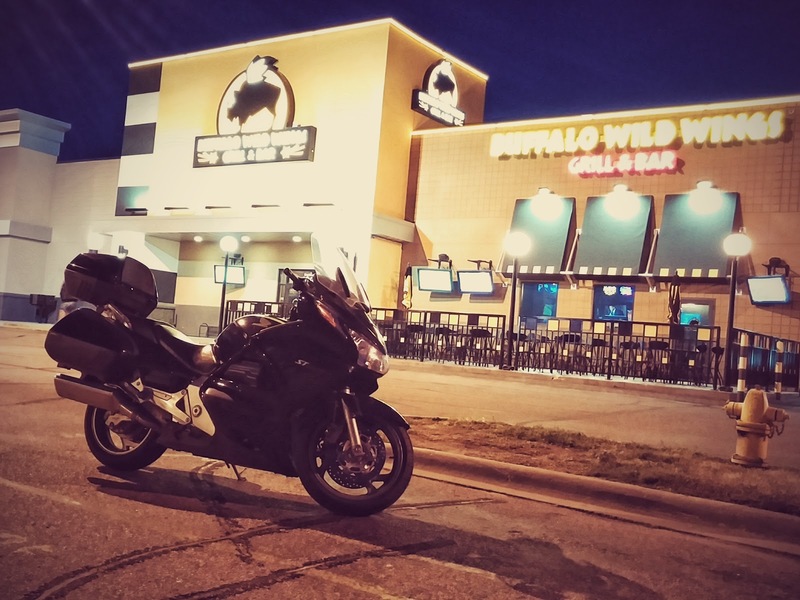 I walked out of a Buffalo Wild Wings in Sioux Falls, SD, carrying a slice of chocolate cake that Sash wanted me to get for her, and seeing Blackbird sitting there patiently waiting for me. I felt fortunate that she hasn't quit on me, ever, particularly now that I'm so dependent on her for my mobility. If I hadn't traveled through all the miles of farmland and wilderness, it would be hard to understand how far from home I am. On the other hand, am I really vulnerable? The 160,000 people who live here in Sioux Falls don't feel vulnerable. If my bike broke down and gave up, why couldn't I just stay here for as long as it takes to get wheels again? I mean, Sioux Falls has everything I seem to want in a town. So, if the possibility of being stuck here wouldn't bother me, then what exactly does bother me, if any? Last Winter, I was a bar in San Diego and this woman was complaining about all the men she had been dating. "How do you figure out men?" she asked me. "Simple", I said. "Look at his strength, the opposite of that is the weakness that drives him." It's the same thing that Sigmund Freud, the famous psychoanalyst once said. "Out of your vulnerabilities will come your strength." People have a habit of obsessing over the things they're afraid of. Many of us, if not the majority, tend to hold so close the things we fear, that we become it without realizing it. Some of us obsess so much with it, that we find comfort in it and refuse to leave it. Few others make it their fantasy and sexualize it. Those who seem to do well with geography, navigation, and always seem to know where they are, probably have a fear of being lost. Those who are surrounded by family, remain connected to their friends, and go out of their way to meet new people, are probably afraid of being alone. People who are great at multi-tasking, take on several projects at once, and work long hours, are probably afraid of disappointing others. There are a few guys I've met who spend so much of their time achieving goals, earning awards, and setting records, that it suggests they have a fear of being insignificant. So what is my strength? What do I fear? Where do I feel vulnerable? I tend to think that no one ever actually knows this about themselves. It takes someone else to evaluate and determine. What we fear was perhaps established at an early age, and over time was forgotten about, but the behavior continues on and on until it just becomes us. We're only reminded of what we fear when it faces us in its rawest form. And there my motorcycle sits in the parking lot, waiting for me to return. I've made myself a permanent wanderer, going to places and communities unlike what I'm used to. I realize few other riders can create a livelihood like this, and so I wonder if that's my strength. But I think not. It must be something more core. But on the other side of the coin, what's my fear? What is it that I'm afraid of that caused me to develop my strength? I tend to believe I'll discover that answer down the road. Great thoughts. Especially the thinking Blackbird about quitting on you part. I have never once even thought about a bike stranding me. Probably not smart enough to have thought about it anyway. Closest I ever got was the Alaska trip. Home on Friday, washed Petunia at a carwash on Saturday, and the ignition switch went out when I tried to start her on Sunday in the garage. For the rest of it, I'm not much of a label kind of guy. I guess I believe that I should leave that up to someone else because I just don't care. Hope you wacky kids have a great time in Sturgis. I'm wishing I was headed that way, but will have to settle for the reports of others this year, again.